*Age 12 & up only. Minors must be with a parent/guardian. Bring your pooch to the pool and end your summer with a splash! 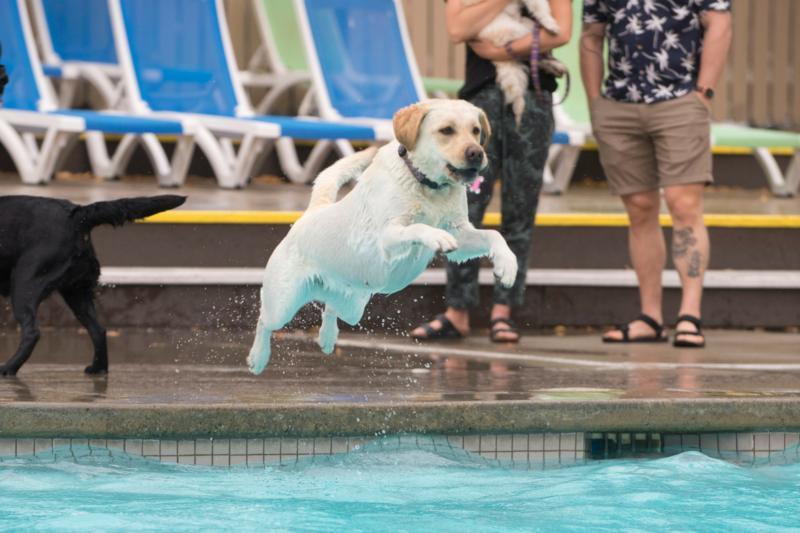 The Edmonton Humane Society’s annual Dog Dive event is returning this year on Saturday, September 8th. This is the ONLY day of the year dogs can jump, play and splash around in Oliver Pool! *NEW THIS YEAR* we are reserving the first hour from 1 to 2 p.m. for small dog swimmers (under 15 lbs.)! Then from 2 to 5 p.m., pups of all sizes are welcome to come for a dip at the pool (with their people too!). The cost is only $5 per dog and $15 per person with proceeds supporting EHS, which cares for thousands of homeless, neglected and abused companion animals each year. Celebrate the end of the dog days of summer with one last splash for the season! Small dogs (under 15 lbs.) from 1 to 2 p.m.
All sizes of dogs welcome between 2 to 5 p.m.
Human swimmers must be age 12 and up. Minors must be accompanied by a parent/guardian.